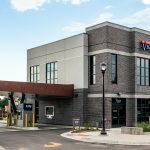 Howell Construction built a new 5,000 square-foot, two story building for Vectra Bank. The structure of the building started with strip footers with complicated stepping stem walls that the first-floor slab poured over. The stem walls supported structural steel columns, steel joist and a composite deck on the second floor and steel decking at the roof. 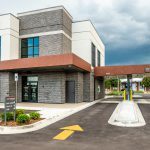 The exterior skin of the building was a well-blended combination of Stucco and Brick Veneer tied together with black storefront windows. The bank branch resides on the first floor and includes a new Class A vault, fireplace with a stone hearth and mantle, Luxury Vinyl Tile, and custom millwork throughout. The second floor houses a conference room, office space and a break room. The whole building is fitted with LED lighting and a top-notch security system.